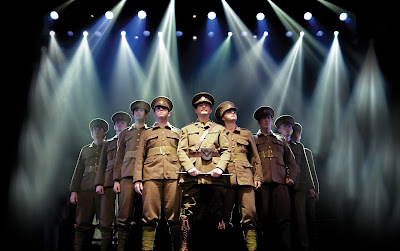 The Dreamers is more a semi-staged music piece than a piece of musical theatre, but once you get over that (and the feeling you are watching an important and earnest history lesson), it is a fascinating story about Capt Reggie Salomons, who died while trying to save his men at Gallipoli in 1915. With original words and music by Kent-based musicians James Beeny and Gina Georgio, this production which originated in Tunbridge Wells last year and is now at the St James Theatre. Beeny and Georgio have an ear for a catchy tune and are part of the six piece band the Virgin Soldiers, which is on stage and provide a contemporary music backdrop to the action happening in front of them with a cast of 20. It is described as a unique piece of theatre, and for a semi-staged piece it looks great with clever lighting. The on-screen narration from various celebrities including Amanda Redman, Christopher Beeny, Sir Tim Rice serves more as a distraction from the story, given they are asked to soberly rattle off various historical facts. Much is spent in the piece describing the major events of The Great War, including if they were due to sail a day later they would have survived as the War Cabinet decided to stop sending troops to Gallipoli. But for anyone unfamiliar with Tunbridge Wells or this particularly story you will be left scratching you head wondering about the significance of Captain Salomons, his popularity, class position, and the horror behind the collision of their ship with a much larger Royal Navy Ship that drowned many men from the Tunbridge Wells area. Perhaps if this piece is going to be re-examined after its tryout at the St James, more should be made of the individual characters and their stories, and less of the the politicians (even if it is to remind us that the legend of Churchill was not based on his role in the Great War) and geo-political tensions. It might make for a more compelling evening. The Dreamers runs at the St James Theatre until 11 July.